This bangle is crafted in sterling silver and set with a diamond for a touch of sparkle. Expands to fit most wrist sizes. An elegant bangle for any occasion. 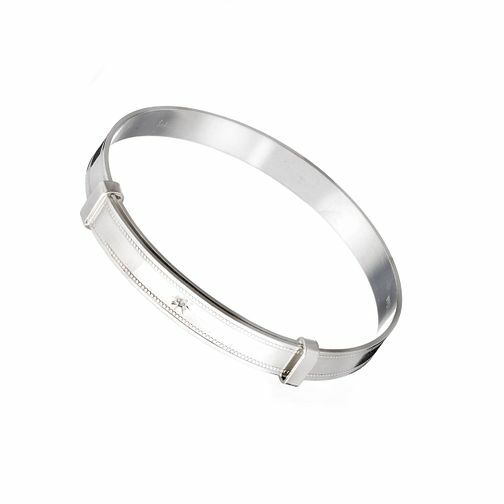 Sterling silver diamond-set child's expander bangle is rated 2.0 out of 5 by 1. Rated 2 out of 5 by Anonymous from Off centre Unfortunately the diamond on this bangle was completely off-centre and looked pretty naff. Was hoping for a good quality product as it is an expensive bangle compared to others on the market. Have returned it and bought a much nicer one for half the price elsewhere. Customer service was excellent though.